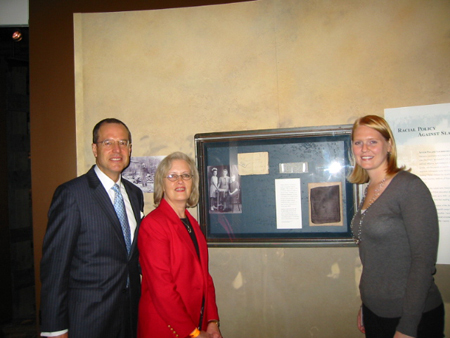 The Illinois Holocaust Museum & Education Center opened a new 65,000 square foot facility on April 19, 2009 in Skokie, Illinois. Located on the main floor is the Zev and Shifra Karkomi Permanent Exhibition, which includes more than 500 artifacts, documents and photographs. Greg and Sandra Milakovich, U.S. contacts for the Arnold-Liebster Foundation, coordinate classroom presentations, teacher workshops, and exhibitions on behalf of the Foundation within the United States. They arranged for an artifact exhibit that contributes testimony about the Nazi persecution of Jehovah’s Witnesses in the Zev and Shifra Karkomi Permanent Exhibition. Bethany Fleming, Director of Collections and Exhibitions at the Illinois Holocaust Museum & Education Center, coordinated the artifact exhibit. in front of the artifacts exhibit.